Prefabricated homes are houses whose parts are produced industrially off-site and assembled on the plot where the house is to stand. Originating as a &quot;cheap&quot; method of building, they have now developed into a good-quality alternative building technique. While the work involved in planning a bespoke house for the client is greater than with traditional buildings, the security of knowing what оnе is to get, together with the short construction time, the precision of manufacture, the energy advantages, the better use of space resulting from thinner walls, together with the cost-efficiency, clearly outweigh the drawbacks. Prefabricated homes may once have lacked individuality and aesthetic appeal when compared with masonry houses, but this is a thing of the past, and their visual attractions are now in no way inferior to those of conventional houses. 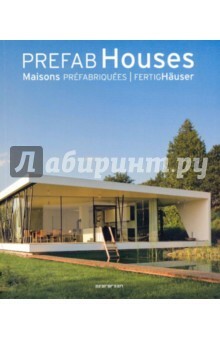 This book, with more than 350 illustrations, plans and elevations together with detailed descriptions, presents 23 prefabricated houses from around the world, each of which exemplifies interesting architectural solutions combining successful design with economic and environmentally friendly building methods. Издание на английском, французском и немецком языках.